Just like humans, dogs suffer from hair loss, too! Although most dogs shed their hair, some breeds tend to do it more often and to a greater degree than others. It is especially common for dogs to “blow coat” to adjust and adapt to seasonal changes. They usually shed more during the summer than the winter months. This happens due to the seasonal shedding rotations related to variations in light. However, if your dog is shedding more than normal, especially to the point of developing bald patches on the body, there’s a good chance your pet pup is suffering from canine alopecia, which warrants proper attention and care. Hair loss in dogs can be a sign of deeper issues. It can indicate medical problems such as an infestation by parasites, like mange, mites, fleas, or ticks, as well as an infection by a bacteria or a fungus, like the ringworm fungus. Allergies can also be responsible for sudden hair loss in dogs, which may be triggered by environmental elements, such as dust, mold, and pollen, or parasites such as fleas and mites. Such adverse reactions can also result from something in the dog’s food, the food dish, or the dog’s blanket. Certain breeds have a higher predisposition for allergies, including Golden Retrievers, Yorkshire Terriers, and Bulldogs. Hair loss can also be indicative of diseases involving certain hormonal abnormalities or imbalances. Hyperadrenocorticism, also known as Cushing disease, and hypothyroidism are two such diseases that manifest themselves through a variety of symptoms including hair loss..
Certain dogs are genetically prone to hair loss, and some are even bred for and named after this very attribute, like the Mexican Hairless and the American Hairless Terrier. Other breeds whose genes make them more susceptible to pattern baldness than others include the Doberman Pinscher, Dachshund, Chihuahua, Italian Greyhound, and Whippet. In the case of elderly or heavy dogs, localized injuries or pressure sores may develop around the elbows, hips, or other bony parts of the body that come in regular and prolonged contact with hard surfaces. On account of the friction and pressure, these parts of the dog’s body tend to callus, lose hair, or even crack and bleed. Stress, organ failure, and poor nutrition are some other causes that can trigger an episode of excessive hair loss in your pet. Dogs that are particularly anxious, grapple with psychological and behavioral disorders, or have been abused in the past are more susceptible to blow their coat. Apply a monthly flea preventative treatment and regularly deworm your dog just to be on the safe side. A hygienic, nurturing, and stress-free living environment will help your pet to maintain a plush and healthier coat. Wash your dog’s bedding at least once a week. If you reside in or frequent areas that are swarming with fleas and ticks, it is essential that you minimize the chances of your pet catching the bug by religiously using flea or tick repellants. Spaying companion animals is also recommended to diminish the risk of this condition. Take your dog to the vet regularly, at least once a year, for routine checkup as well as blood and urine testing to ensure that your furry pal is in the pink of health. Hair loss in dogs is a solvable problem, and you can easily fix it with some simple and effective home remedies. Treatment with home remedies is a gradual process, and you cannot expect to see the results overnight. Have patience, and improvement will follow. 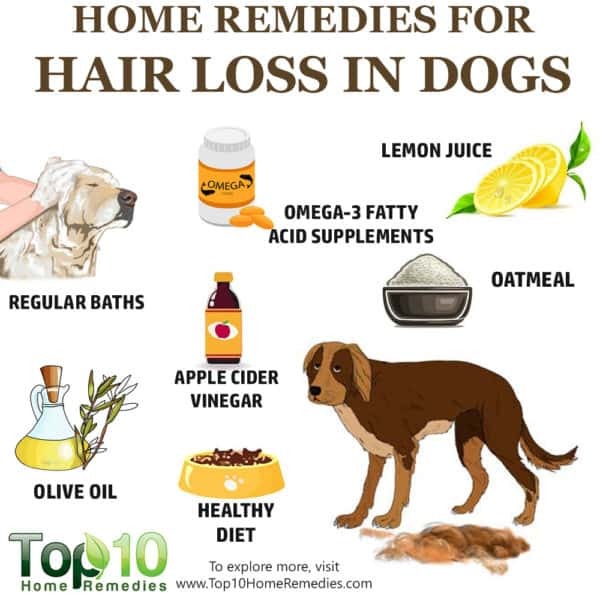 Here are 10 home remedies for hair loss in dogs. For hair loss in dogs due to an infection or allergy, apple cider vinegar is the best remedy. It has antibacterial and antifungal properties and helps restore the acidic nature of your pet’s skin, kill off pathogens, and reduce the itchiness. It also gives your pet’s immune system a much-need boost. The bitter taste may also act as a deterrent for dogs that keep biting at the affected area to relieve the persistent itch, causing clumps of hair to fall off and, in some cases, even graver trauma or self-harm. Pour raw, unfiltered apple cider vinegar and an equal amount of water into a spray bottle. Give it a shake to mix the ingredients. Spray the solution all over your dog’s skin. Allow it to dry on its own. Use this remedy 1 or 2 times a day, depending upon the severity of hair loss. Also, add raw, unfiltered apple cider vinegar to your dog’s food once daily for a week. The dose is 1 teaspoon for dogs up to 14 pounds, 2 teaspoons for dogs between 15 and 34 pounds, and 1 tablespoon for dogs between 35 and 85 pounds. Note: Do not apply undiluted apple cider vinegar on your dog’s body as it can cause the wound to sting. Olive oil is a good home remedy to apply on a dog’s coat and skin, especially when the dog is suffering from excessive hair loss. Olive oil helps smother mites and control mange, two common causes of hair loss in dogs. The vitamin E in olive oil also moisturizes the dog’s skin as well as soothes any irritation caused by severe itching. The oil also promotes the growth of new skin and hair in the affected areas. To further reap the benefits of this magic potion, incorporate it in your pet’s diet as well. Rub some extra-virgin olive oil directly on your dog’s skin, so that it gets fully absorbed into the skin. Repeat 2 or 3 times a day. Olive oil can be given orally, too. However, check with your vet regarding the recommended dosage for your specific dog breed. If your pet’s hair loss is due to mange or mites, lemon juice can be particularly effective in dealing with the symptoms. Lemon juice has natural antibacterial properties that can treat a dog’s hair loss problem. Being highly acidic, it can successfully kill the microscopic parasites and help heal the damaged skin. Cut up 1 lemon (along with the peel) into small pieces. Add the lemon pieces to a pan filled with water and bring it to a boil. Turn off the stove, cover the pan, and allow the solution to steep overnight. In the morning, apply the mixture on your pet’s coat using a sponge. Note: Do not apply lemon juice directly on a wound as it can cause a burning sensation. Whether used orally or topically, coconut oil may be the answer to your dog’s hair loss and itchy skin woes. Coconut oil contains lauric acid, which is known to exhibit antibacterial, antiviral, and antifungal properties. Thus, coconut oil can prove to be effective against infections that are often at the root of your dog’s coat shedding. Furthermore, the high fat content of coconut oil keeps the skin moisturized as well as stimulates the growth of healthy new skin and hair. Also, the lauric acid in it helps build up the topical immunity of your pet. To apply topically, thoroughly mix ½ cup of extra-virgin coconut oil and 2 drops of oregano oil. Rub the mixture on your dog’s coat, especially on patches where there is excessive hair loss. Do this twice daily. To administer orally, add 1 teaspoon to 1 tablespoon of extra-virgin coconut oil (depending on the size of your dog) to your dog’s meal once a day. Aloe vera is a great remedy to prevent hair loss due to excessive itching. It works as a soothing balm to alleviate the skin irritation, thereby preventing your pet from scratching at the affected site, which is often responsible for additional hair loss. Due to its natural antiseptic and antiparasitic nature, aloe vera is a great remedy for mange in dogs, one of the most common reasons behind hair loss in pets. Give your dog a nice soapy bath and allow the fur to air-dry. Apply fresh aloe vera gel on the skin. There is no need to rinse the gel off the skin. Caution: Do not allow your pet to ingest the aloe vera, and contact your veterinarian immediately if they do. If the hair loss is associated with widespread itching, an oatmeal bath is the way to go. Oatmeal soothes, nourishes, and moisturizes your pet’s skin, which in turn relieve the itchiness and keep your pet comfortable. It can also be helpful in relieving hot spots and removing fleas, ticks, and other allergens. Add 1½ cup of ground oatmeal to a big tub filled with warm water. Mix in a few drops of lavender essential oil. Repeat once daily for as long as your dog’s itchy skin persists. You need to give your canine friend frequent baths to maintain a healthy skin and prevent hair loss, especially during spring and summer. Regular bathing will help dislodge any possible skin allergens like dust mites, mold, and pollen as well as bacteria and fungi that may be festering on the dog’s skin or in the dog’s hair follicles. This will help your pet skirt the risk of an impending skin flare up and consequent hair loss. The frequency of bathing varies depending on your dog’s breed, coat, activity level, and any medical conditions. It can be from once a week to once a month. Ask your vet how often you should bathe your pet. Also, use the correct shampoo to bathe your dog. A good shampoo can stave off a number of skin problems as well as make your dog’s coat look nice and shiny. You can ask your vet for the preferred variety of shampoo for your pet. To maintain a healthy skin and coat and prevent hair loss, groom your dog regularly. Brushing your dog’s coat will help get rid of allergens that can lead to hair loss. Doing this regularly also helps disperse the dog’s skin oils into the fur. This, in turn, helps the fur to stay in its place. Furthermore, regular brushing stimulates the skin and hair follicles, which in turn increases the natural production of skin oils that make the coat shiny. Brush your dog at least once every other day. Always select an appropriate brush for the type of fur your dog has. Also, if your dog has long hair, keep it trimmed to prevent skin and coat problems. A nutritionally rich diet plays an important role in maintaining the health of your dog’s skin and preventing hair loss. Remember, the better your dog’s food, the better will be your dog’s immunity, which is important for fighting different kinds of diseases. Hair is mostly made of protein, so a protein-based diet is important. In addition, your dog’s diet should include healthy fatty acids, calcium, phosphorus, magnesium, potassium, iron, zinc, copper, folic acid, biotin, and vitamins A, B6, B12, C, D, and E.
Try to introduce some homemade options to your dog. Cooked chicken breast, cooked vegetables, or fully cooked rice are some good options to feed your pet. If the hair shedding remains unabated despite a well-rounded diet, it is likely that the condition may be stemming from certain elements in your pet’s food. A common giveaway for food allergies is that they are typically accompanied by other symptoms, such as vomiting, diarrhea, itching, frequent ear infections, frequent hot spots, dry skin, and scratching-induced hair loss. If you suspect that a food allergen is at play, enlist your vet’s counsel to put your pet on an exclusion diet, which will help you determine the problematic food item and thereby eliminate it from your dog’s meals. The most common allergy-triggering foods in dogs include wheat, corn, soy, eggs, and even beef or chicken. There are some dogs that are so sensitive to certain proteins that they need to be put into novel protein or hydrolyzed protein diets. Consult your veterinarian and determine which foods are best for your pet. Also, it’s good to keep in mind that these signs can also be early indicators of irritable bowel syndrome (IBD), which can greatly affect your pet’s health as they get older. Have routine checkups with your dog’s vet to diagnose and treat any underlying disease early. Healthy fats, such as omega-3 fatty acids, play an important role in keeping your dog’s hair in good condition. Also, it can make the hair strong and prevent hair loss. Plus, the anti-inflammatory nature of omega-3 fatty acids help shield your pet from allergies or other inflammatory skin conditions. Conversely, a deficiency of fatty acids can make your pet’s coat look dull and lifeless. Dogs’ physiology does not allow them to produce certain carbon bonds that create these fatty acids, which is why supplementation is helpful. Knowing this, it is recommended to specifically look for high-quality omega-3 supplements that contain EPA and DHA. Supplements come in liquid or capsule form. You can choose whichever is comfortable for you to feed to your dog. Consult your vet before giving your dog any kind of supplements. For seasonal hair loss, you can also try applying almond oil to your pet’s hair. Melatonin therapy can work as a natural treatment for hair loss in dogs. Benadryl is a common antihistamine that can be administered to dogs who suffer from allergic reactions. Add molasses to your dog’s food. The dosage is 1 teaspoon per 10 pounds. For hair loss due to a yeast infection, yogurt is a good remedy. Use sulfur soap to bathe your dog. Its alkaline nature helps keep mange under control and reduces inflammation. Your dog may need antibiotics prescribed by your veterinarian to treat any infection causing your dog to lose hair. Moriello, DVM, DACVD K. Hair Loss (Alopecia) in Dogs – Dog Owners. Merck Veterinary Manual. 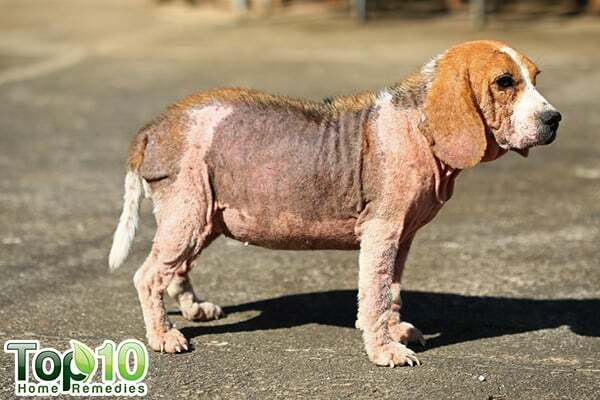 https://www.merckvetmanual.com/dog-owners/skin-disorders-of-dogs/hair-loss-alopecia-in-dogs. Costa GM, Júnior FAFX, Araujo Slima. A clinical and diagnostic approach of a dog with hyperadrenocorticism and hypothyroidism related: Case report. Research Gate. https://www.researchgate.net/publication/312101016_A_clinical_and_diagnostic_approach_of_a_dog_with_hyperadrenocorticism_and_hypothyroidism_related_Case_report. Published January 2016. Peterson, DVM, DACVIM M. Hypothyroidism – Endocrine System. Merck Veterinary Manual. https://www.merckvetmanual.com/endocrine-system/the-thyroid-gland/hypothyroidism. Joshi VK, Sharma S. Cider Vinegar: Microbiology, Technology and Quality. SpringerLink. https://link.springer.com/chapter/10.1007/978-88-470-0866-3_12. Published January 1, 1970. Dias MFRG. Hair Cosmetics: An Overview. International Journal of Trichology. https://www.ncbi.nlm.nih.gov/pmc/articles/PMC4387693/. Published 2015. Löflath A, Voigts‐Rhetz AV, Jaeger K, Schmid M, Kuechenhoff H, Mueller RS. The efficacy of a commercial shampoo and whirlpooling in the treatment of canine pruritus – a double‐blinded, randomized, placebo‐controlled study. Veterinary Dermatology. https://onlinelibrary.wiley.com/doi/abs/10.1111/j.1365-3164.2007.00639.x. Published November 6, 2007. Watson T. Diet and Skin Disease in Dogs and Cats | The Journal of Nutrition | Oxford Academic. OUP Academic. https://academic.oup.com/jn/article/128/12/2783S/4724467. Published December 1, 1998. Bradberry JC, Hilleman DE. Overview of Omega-3 Fatty Acid Therapies. Pharmacy and Therapeutics. https://www.ncbi.nlm.nih.gov/pmc/articles/PMC3875260/. Published November 2013. Fischer TW, Slominski A, Tobin DJ, Paus R. Melatonin and the hair follicle. Journal of Pineal Research. https://onlinelibrary.wiley.com/doi/full/10.1111/j.1600-079X.2007.00512.x. Published October 25, 2007. Paterson S. Use of antihistamines to control pruritus in atopic dogs. Journal of Small Animal Practice. https://onlinelibrary.wiley.com/doi/pdf/10.1111/j.1748-5827.1994.tb03867.x. Published June 28, 2008. Lans C, Harper T, Georges K, Bridgewater E. Medicinal plants used for dogs in Trinidadand Tobago. Elsevier Preventive Veterinary Medicine. https://www.researchgate.net/publication./12496030_Medicinal_plants_used_for_dogs_in_Trinidad_and_Tobago. Published February 2000. Probably In India we do not have much canine to take care of. Hence we do did not look importance to the article.